It’s a great week for lovers of reading! Sure, every week is a good week for reading, but two major events this week give us plenty of opportunities to celebrate books and readers! I think these celebrations are important for building a community of readers, for modeling reading for pleasure, and associating joy with the act of reading. Although typically celebrated on March 2nd to coincide with the birthday of Dr. Seuss, this year we celebrated on Monday, March 3rd. Teachers gathered every book they could find penned by Theodore Seuss Geisel. Some found fun facts about the man (including the REAL pronunciation of his name). Some had extra DEAR time or Read to Self. I really got into it this year. My inspiration came from a group of teachers in my district who wanted our local education association (a.k.a. ‘evil teacher union’ to some) to do more outreach for children and community. We took on Read Across America as one of our causes. 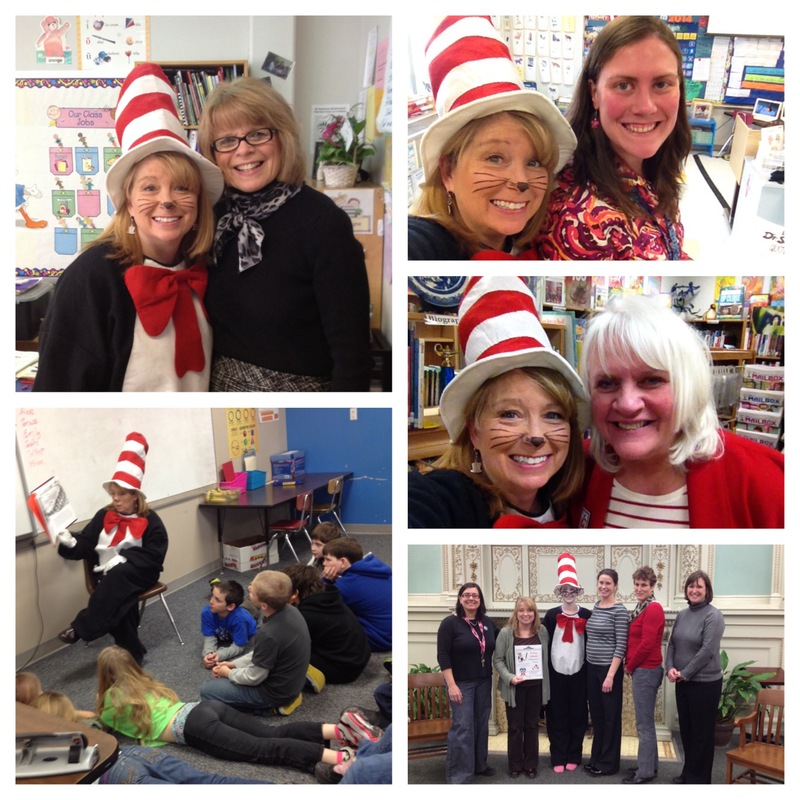 We collaborated with our local library (Lithgow Library) to crea te a Read Across America Night for families. One of our newest teachers, Ms. Bryant, contacted our state association to acquire our Cat in the Hat costume. 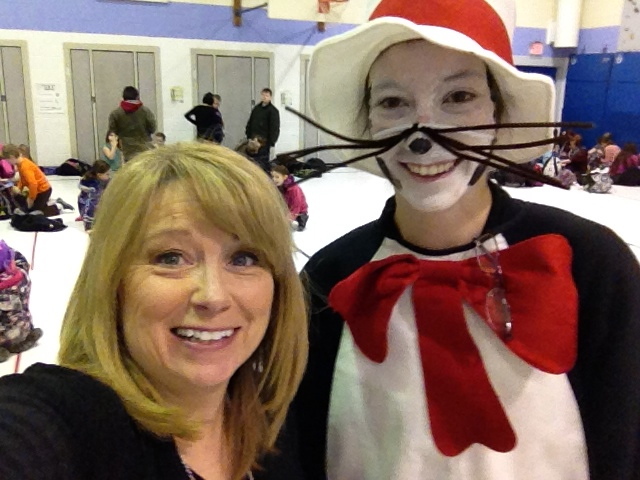 During the day I visited 3 of our elementary schools as the Cat and Ms. Bryant assumed the feline role for her home school and the library celebration. It quickly became one of my favorite days ever as a teacher. Some kids looked at me with such cognitive dissonance. There was a hint of recognition, yet they approached me anyway with excitement and affection. Others were just so joyful and eager to pet, hug and tug on the Cat! I read in classrooms, listened to kids read, took lots of group photos of eager readers and happily dissolved into the persona of Le Chat Au Chapeau! My day as “The Cat”. 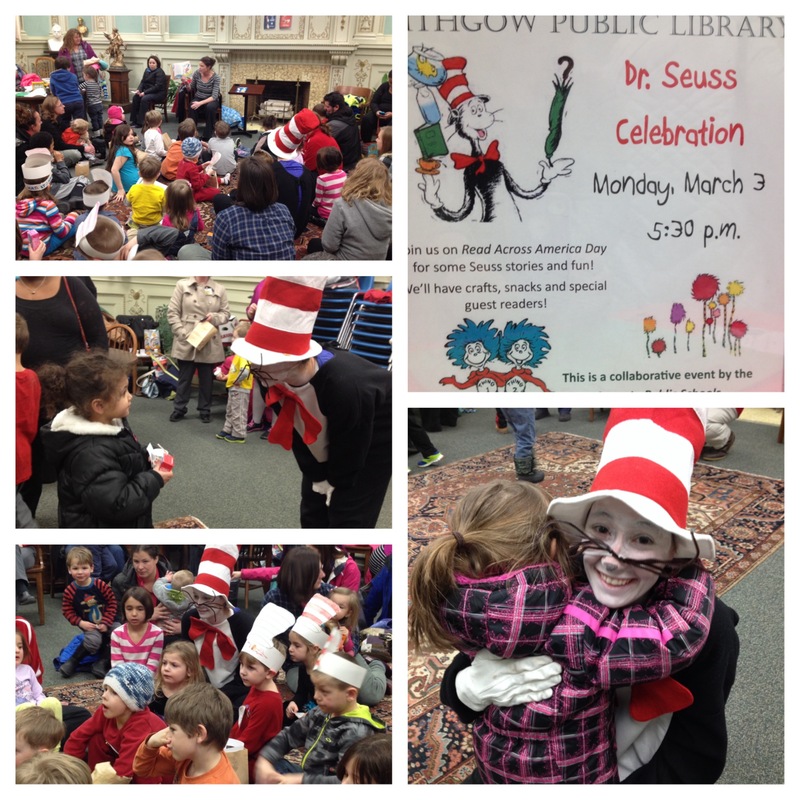 Our evening Dr. Seuss Celebration in collaboration with our local library. There’s still time to continue the reading celebration this week. March 5th is World Read Aloud Day. It’s a grassroots movement that LitWorld started to with the idea that “Children who grow up as readers become engaged citizens of the global world, and every child deserves that right to read.” You can read founder Pam Allyn’s blog on HuffPost here. You can visit Lit World’s World Read Aloud Day page. Here are some World Read Aloud Day Activities. Here are some Read, Write Think Activities and Resources. But the best thing about reading is that you don’t need a holiday to do it. You only need a book. You need a teacher, parent or mentor to help you make sense of those squiggles on a page so that the ideas lift off the paper and create stories in your mind. These holidays and events just remind us that every child has that right and it is up to us to help them realize all the possibilities in life that reading can offer them! This book is as hilarious as it is touching. Nate Foster has wanted to be in a Broadway musical his whole life (all dozen or so years of it.) He takes a runaway road trip from his hometown in Pennsylvania to audition for “E.T. The Musical” He doesn’t really fit in in his hometown of Jankburg, PA. His brother is an all star jock, Nate is bullied and school and describ es himself as “a freshman at the College of Sexuality and I have undecided my major”. It’s great to see books about boys who aren’t just jocks or thugs or bookworms. 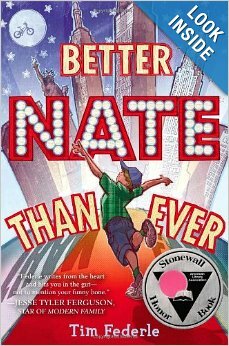 Nate is a refreshingly humorous, sensitive and daring boy who recognizes his differences and embraces them. 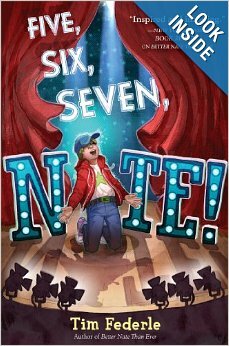 You can watch Tim Federle read from Better Nate Than Ever here! PROFESSIONAL BOOKS: How’s It Going? So excited that I will see Carl Anderson in Portsmouth, NH tomorrow with his Heinemann Workshop. I’ve participated in a book study in our district with How’s It Going. If you haven’t read this one and you want to improve your practice with writing conferences, it is a MUST READ for your professional library! He isn’t called “Conferring Carl” for nothing! !